Renowned choreographer Shobana Jeyasingh has become known for creating adventurous and experimental dance but her latest work steps up a gear to expose an unsavoury episode of Britain's colonial past. Serendipity had played its part in bringing about this new striking dance production Material Men Redux by London-based Shobana Jeyasingh Dance for when the choreographer started to work with hip hop dancer Shailesh Bahoran and traditional Indian dancer Sooraj Subramaniam, she found that despite their opposing styles, they had a common heritage. Both dancers had ancestors who had migrated from India to live a harsh life working on plantations. Following up on this theme, Jeyasingh discovered the history of 'indentured labour' - when there was huge migration and exploitation of people from British colonies, like India, to sugar and rubber plantations to fill the labour gap after the end of slavery in the 19th Century. 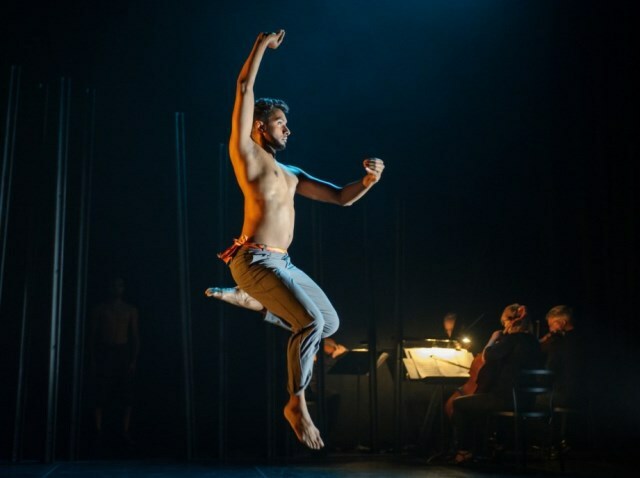 Combining traditional Indian dance with breakdance to a soundtrack of music from a live string quartet and also electronic sounds and words, this production delves into deep, dark themes of identity, loss and exploitation. I saw the dance show in the intimate Patrick Centre, within Birmingham Hippodrome, where it stays for two days from March 27 to 28. It then continues on tour to Glasgow and London in April. The production starts off in history, using recorded voices that recite shocking real-life letters between British landowner Gladstone to a contact in Calcutta requesting labour for plantations to be shipped off to far shores like Suriname, then called Dutch Guiana. There are just the two dancers on stage and the hip hop moves suit this section particularly well to show the struggles of the migrants. Cleverly thought-out choreography sees the two dancers use a piece of sari material between them as it becomes an artful accessory to their dancing. The material also later acts as a screen on which stark black and white archive film images by Simon Daw from the colonies are projected. The most poignant of these early scenes is when a list of the deceased and their cause of death is read out and the performance fits in with the words, ultimately seeing the sari cover one of the dancers like a body bag. This reflects the 20 per cent of workers who died in the first year either through transportation, suicide, work accidents or the struggles of the gruelling work. Once the history has been laid bare, the action moves to current times, to the descendants and these two dancers, who then have a dance off between their hip hop and traditional Indian styles. There's showmanship, respect and teasing between the pair, who you realise are where they are today as products of their families' pasts. Music in the production fits beautifully and has been specially commissioned. The sensitive string music performed by The Smith Quarter has been written by Australian composer Elena Kats-Chernin while the additional sound design by Leafcutter John is menacing. Watching this production, I felt that my eyes were being opened to a new side of colonial history that I hadn't seen before. It may be a complex topic but Jeyasingh hasn't shied away from tackling such a controversial issue. What she has created in Material Men Redux is a powerful, dynamic and thought-provoking show that stays with you long after you have left the theatre. March 27 & 28 - 7.45pm. Tickets are priced at £16. For further information and to book, call 0844 338 5000 or visit the Birmingham Hippodrome website.